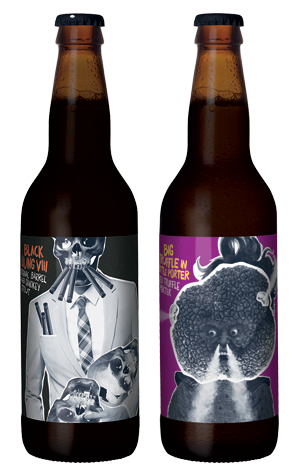 Now into its eighth year, Moon Dog's Black Lung – the smoky stout where each iteration spends time in a different species of barrel prior to release – is one of the most hotly anticipated releases from the Abbotsford brewery. Indeed, we even chose to run a feature on it. It's been intensely smoky, lush and creamy, spicy and fruity over the years, so where does version VIII sit? It's been aged in ex-Cognac barrels and one assumes they came with a fair amount of their former inhabitant still hanging about as there's a juiciness – a fortified fruitiness – arising from its murky deep brown swirl that's more distinct than the smoke and oak that has featured strongly in past vintages. Beyond that, you'll find a stout that leans more towards the sweeter end of the spectrum – lots of dark chocolate, even darker caramel, toasted nuts and honey – but with a woody, earthiness too and a faintly orangey, liqueur like finish. In 2018, it has a second dark-hued longneck for company. It comes in the shape of Big Truffle In Little Porter, a beer featuring not just salted truffles but vanilla too. And, while this isn't the first time Moon Dog has used truffles in beer (remember this beauty? ), this is the first one where you might want to reinforce the entry points to your home to ward off the inevitable stampede of truffle pigs. We don't know how many truffles were added but, boy, they make themselves known, particularly aroma wise, creating an effect that brought the unlikely word combo "Pepsi Truffle" to mind.